Dozens of Russian UAVs were on display at the ARMY 2017 International Military-Technical Forum held last month at Kubinka west of Moscow. 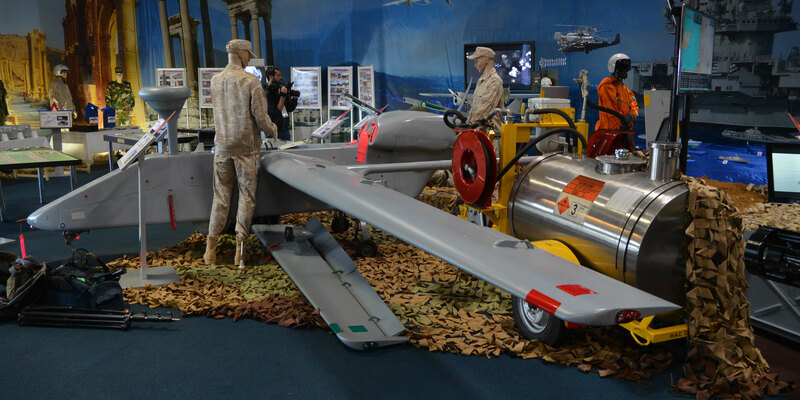 In addition to numerous designs the industry brought to the show, the Russian armed forces exhibited a few in-service examples and briefed forum participants on their use against “unlawful armed formations.” Earlier this year the Russian MoD reported that it had deployed approximately 80 UAVs in Syria. “With help of unmanned air vehicles, we have been monitoring the situation across almost the entire Syrian territory all day round,” a defense ministry official stated. During almost two years since the Russian expeditionary force first arrived at Khmeimeem air force station in Latakia, the grand total of UAV flights has exceeded 14,000. But this is still only half of the total flown by manned Sukhoi combat jets, at 28,000 sorties (for 90,000 air strikes). No statistics have been made available for helicopters, but they are understood to be making as many as 100 sorties daily to fire-support the Syrian troops. The heaviest of the UAVs deployed by Russia to Syria appears to be the 370-kg (815-pound) Forpost, a licensed copy of IAI Searcher II. This model is understood to be the only UAV type employing conventional takeoff and landing procedures at Khmeimeem. The majority of unmanned flights over Syria are performed by lightweight vehicles belonging to the Orlan, Granat, Eleron and Taxion families. They feature internal combustion engines, catapult-assisted takeoff and parachute landing. Weighing between five and 30 kilos (11 and 66 pounds), they have a loitering capability ranging from two to 16 hours (for the Orlan-10), at altitudes of 300 to 3,000 meters (1,000 to 10,000 feet). Most of those designs are advertised to have lifetime of one hundred flights or flight hours, yet the best have proved capable of withstanding 10 times that, according to MoD officials. The smallest designs in use are hand-launched Granat-1/2s with electric motors and 78-minute loitering capability. These are used by the Russian special forces to provide battlefield reconnaissance, finding and illuminating targets for combat jets and artillery, spotting and killing terrorists. Russian air power has largely achieved its original goals of saving Bashar Al-Assad’s regime, helping its forces to prevail on the battlefield and forcing “moderate opposition” into accepting a truce on Moscow’s terms. UAVs have played a prominent role in that process. Despite the recent advances in high-tech equipment, however, the expeditionary force at Khmeimeem appears to lag behind the U.S.-led coalition in advanced unmanned systems technology, most notably high- and medium-altitude long-endurance air vehicles, as well as UCAVs. Such systems are still in development or flight tests, and it may take Russia several more years before rendering them operational. It is interesting to note that the Russian armed forces are keeping outdated systems in their inventory. As it became clear at ARMY 2017, the Stroi-P from Kulon employing a 140-kg (310-pound) Schmel-1 (Yakovlev’s Pchela first flown in 1983) is still in service. Combat-tested in Chechnya late last century, the system has a loitering capability of merely two hours, the same as for the more recent Orlan with takeoff weight 25 times less yet offering basically the same functionality. A veteran of the 1982 Lebanon war, the 1,400-kg (3,100-pound) Tupolev Tu-143 Reis also remains operational despite having a maximum flight duration of a mere 13 minutes. Nearly 1,000 copies were built between 1976 and 1989, with surviving examples spotted during the recent hostilities over Eastern Ukraine.